Connecting remote teams can be a challenge, but virtual meetings can make all the difference. With so many virtual meeting platforms on the market, you need a hassle-free solution that drives collaboration for all types of users. 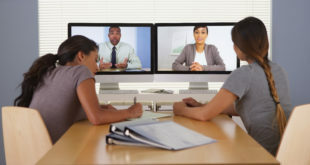 Check out these five virtual meeting collaboration tools that benefit remote teams. When remote employees host or attend virtual meetings, setup can be a hassle. Some virtual meeting platforms require clunky downloads and installation steps. Don’t waste everyone’s time – GlobalMeet simplifies the setup process for all users with one-click access. Quick setup gives teams more time to focus on collaborating during the meeting. In most cases, remote teams use a variety of devices during their workday. Teams work best when they have the flexibility to join virtual meetings on their preferred device. With GlobalMeet, remote teams have the flexibility to host and join virtual meetings on a desktop, laptop, cell phone or tablet. GlobalMeet streamlines meetings by offering convenient desktop and mobile apps. In addition, teams working in a Microsoft environment can use the Outlook toolbar for easy access. Teams that work remotely have few opportunities to collaborate in person. With GlobalMeet, you can offer remote teams a personalized, collaborative meeting experience. HD video allows teams to connect on an interpersonal level, which can help elevate meeting collaboration and engagement. Effective virtual meeting collaboration relies on easy access to sharing important information. With remote desktop control, remote teams can work together hassle free. GlobalMeet offers a Remote Desktop Control feature that allows teams to remotely access and control a user’s desktop. Use this tool during virtual meetings to empower presenters to effectively share meeting content. With so many businesses leveraging Microsoft solutions, MS Teams has become a widely-used component of this environment. Remote teams within this ecosystem can enjoy seamless integration with GlobalMeet, which is geared for Microsoft Teams. Remote workers can start and join meetings within MS Teams. More importantly, they will enjoy a quality collaboration experience with reliable, global audio capabilities. Are you ready to embark on these collaboration tools for remote teams and more? Virtual meetings offer these benefits and so much more, find out by signing up for GlobalMeet free today!